Chinese New Year (CNY) is all about meeting your one-year-see-one-time relatives and, for the singles, collecting angbaos! 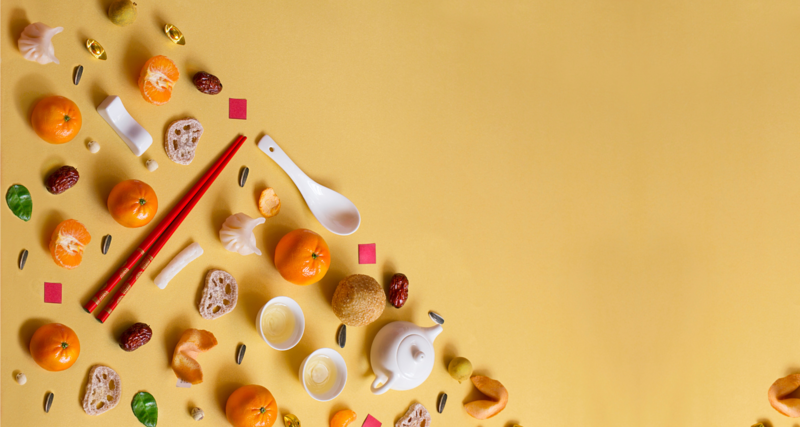 This 2019, many brands have taken on the challenge of differentiating themselves through formulating never-before-seen snacks with special flavours. If you are still fretting over which brands and snacks to turn to, we have shortlisted a few noteworthy ones so that you will be spoilt for choice! Be sure to stay till the end as we have a surprise for you! What’s Chinese New Year without some nuts to munch on? Recently launched, the Nutkins specialises in formulating freshly-baked peanuts with a local twist! With baked prawn and black pepper crab flavoured peanuts on the table, you will definitely be the coolest host around! The Chinoiserie CNY collection by Pulse Patisserie offers a fusion of Asian and Western flavours. Available for purchase online and in stores, the extensive menu brings a trendy twist to the traditional CNY goodies. 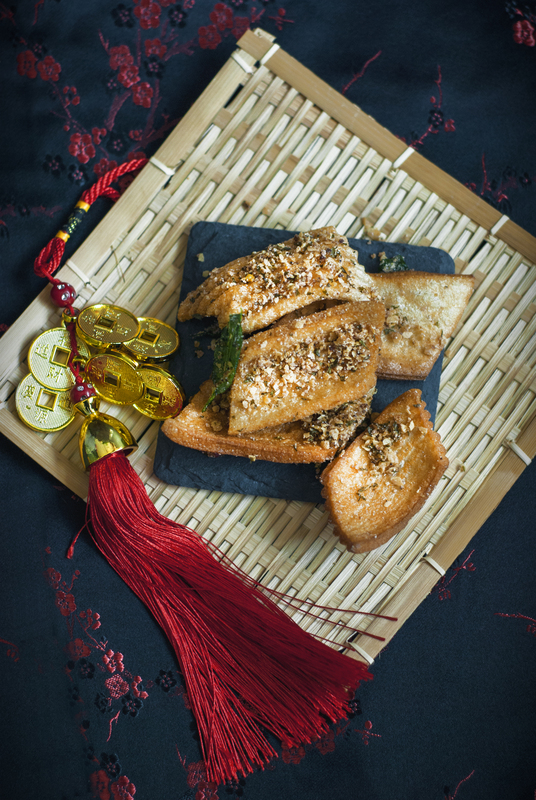 This festive season, impress your guests with their Bonito Puff Strips and Brown Rice Brittle! Kindly place your order at least 3 days in advance. For bulk orders of more than 20 bottles, do order 5 working days in advance. 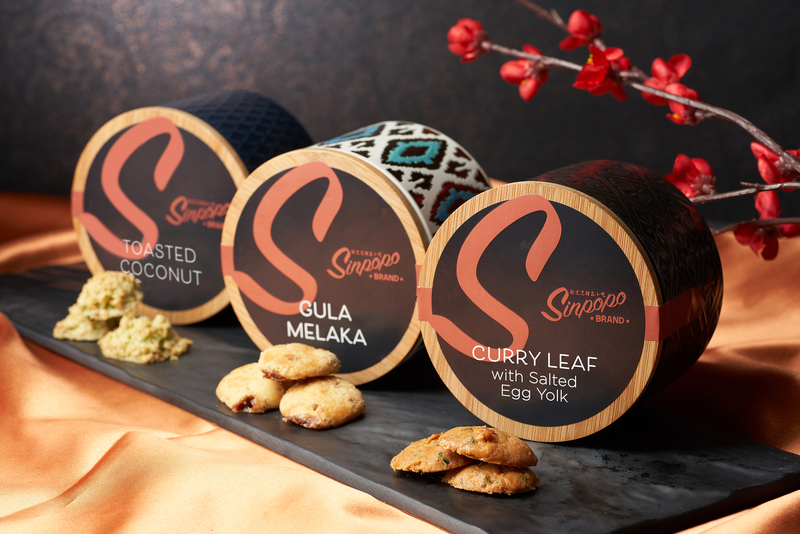 Sinpopo has launched their premium Lunar New Year Collection 2019 with a delectable selection of Singapore-infused treasures. 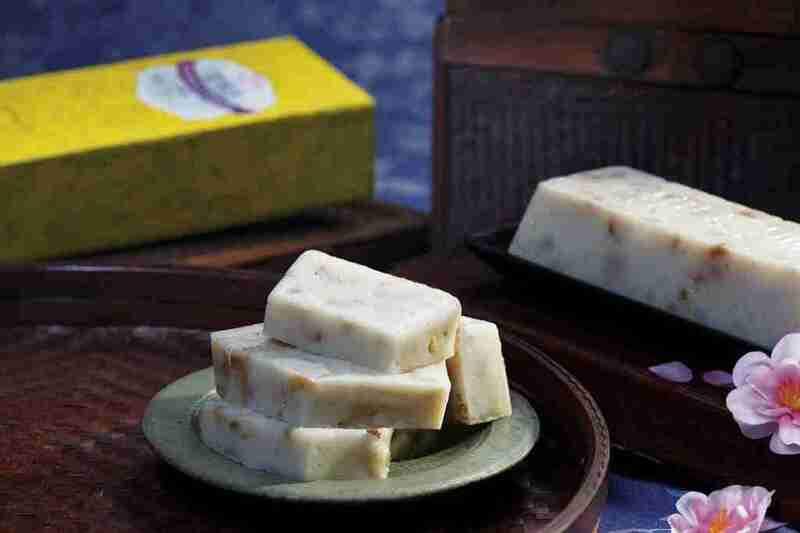 Featured one-of-a-kind products include the Gula Melaka Honeycomb Cake and melt-in-the-mouth Curry Leaf with Salted Egg Yolk gourmet treats. This is the last seasonal collection at the Paragon Orchard pop-up store before it closes in late February 2019. The store is set to re-open in April 2019. Available for pre-order and collection in-stores from 15 January 2019 at both Sinpopo stores. Call hotlines (Katong/Paragon) to make an order. 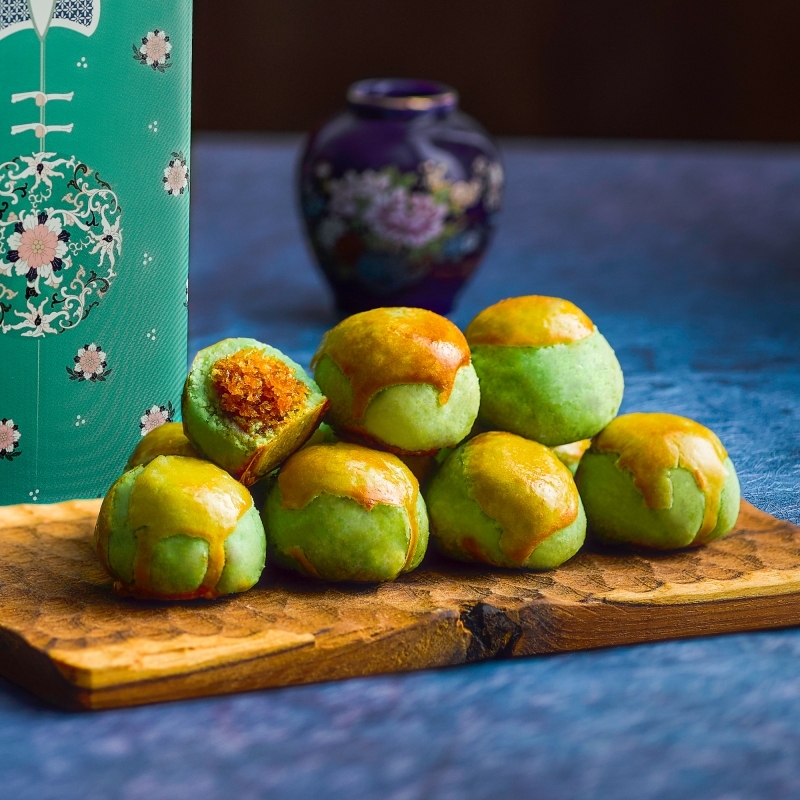 Apart from the traditional pineapple tarts that have won the hearts of many, Old Seng Choong has created new cookie and pineapple tart flavours this CNY. These nostalgic tastes will undoubtedly make you feel at home. 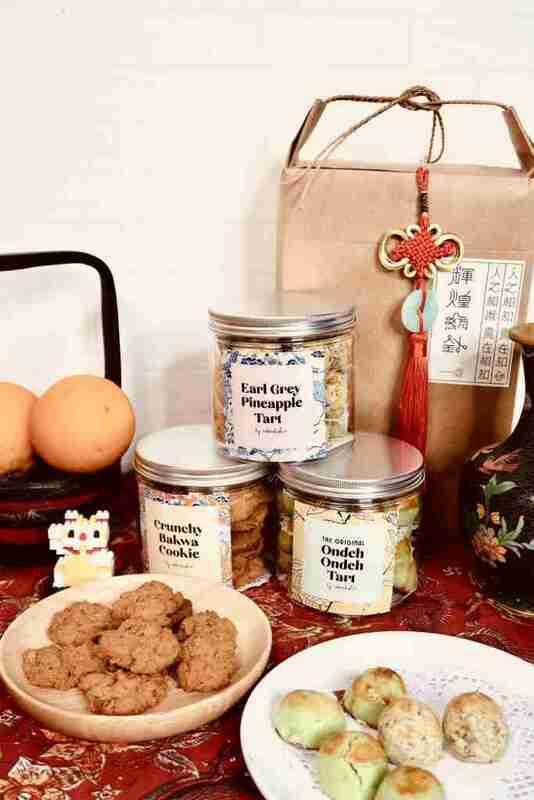 And if their CNY Collection is not enough, they have a whole range of familiar cookie flavours from Mala to Bak Kut Teh! 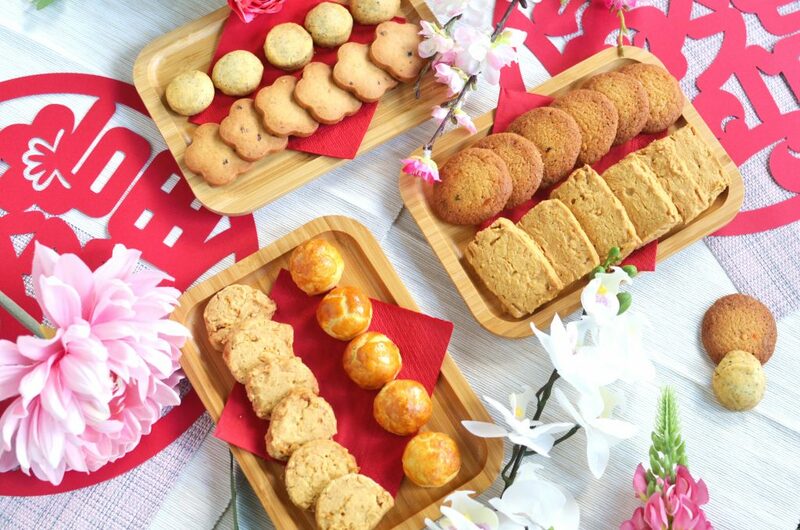 Bake & Bake has 9 delicious biscotti flavours lined up this CNY, wrapped in an auspicious bright red packaging! 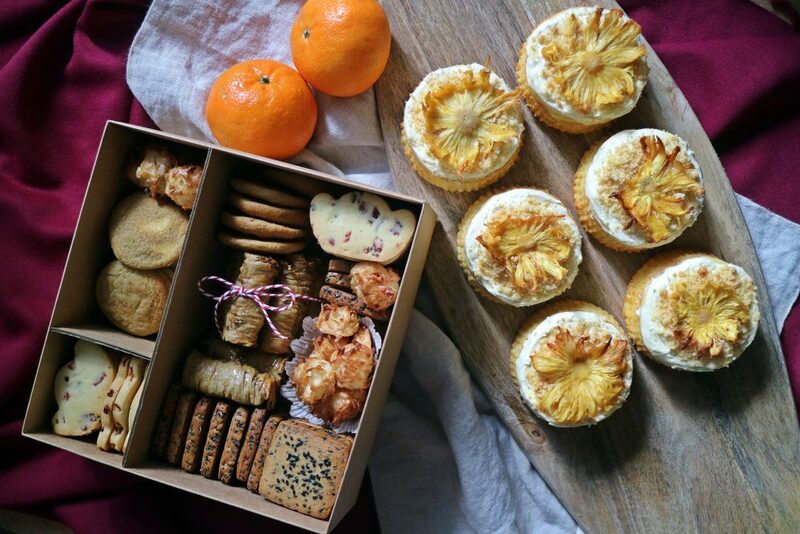 Perfect for gifting and snacking, these mouth-watering treats are jampacked with fillings. 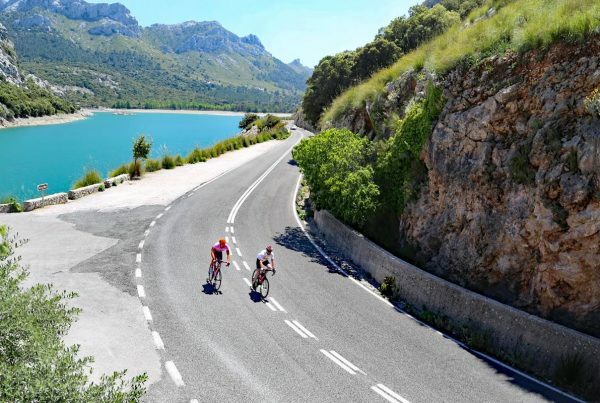 Moreover, all prices are the same as off-peak period prices despite the festive period. Order by: 15 January 2019 (online orders) – after which, all products will be available in store at Plaza Singapura. Kindly place your order at least 3 – 4 days in advance. Keeping it classic, Sugar by J Cake has the best recipes for cookies! 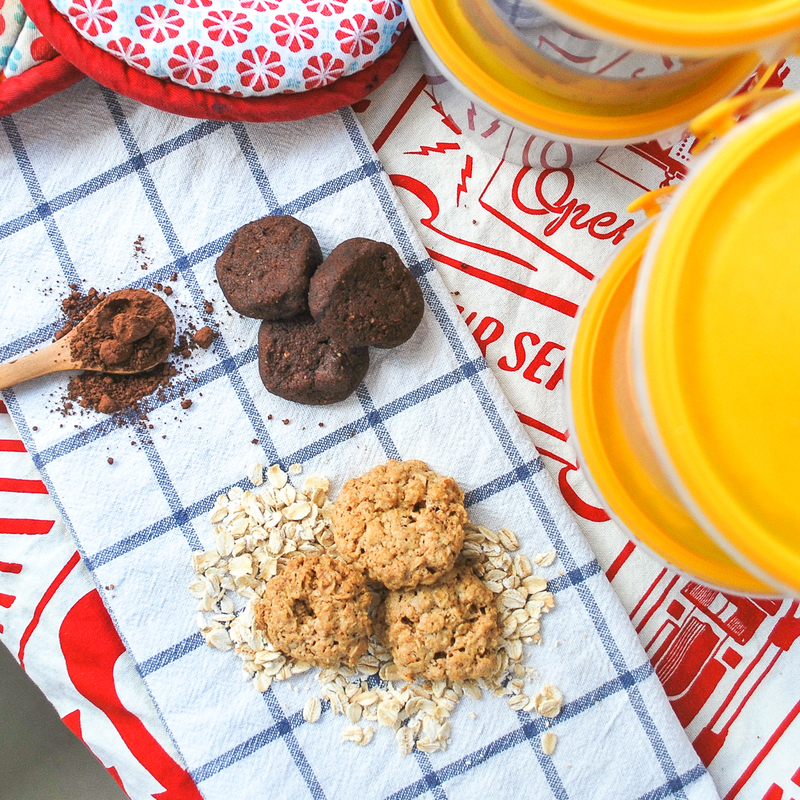 They have re-launched their well-loved Oat Cookies, which is a more wholesome version of cornflake cookies, as well as rich Chocolate Sables. Once you have a bite, you simply cannot stop! Kindly place your order at least 3 – 5 days in advance. Exact location and collection timing to be arranged after confirmation of orders. If you have not tried edible cookie dough before, you are missing out! 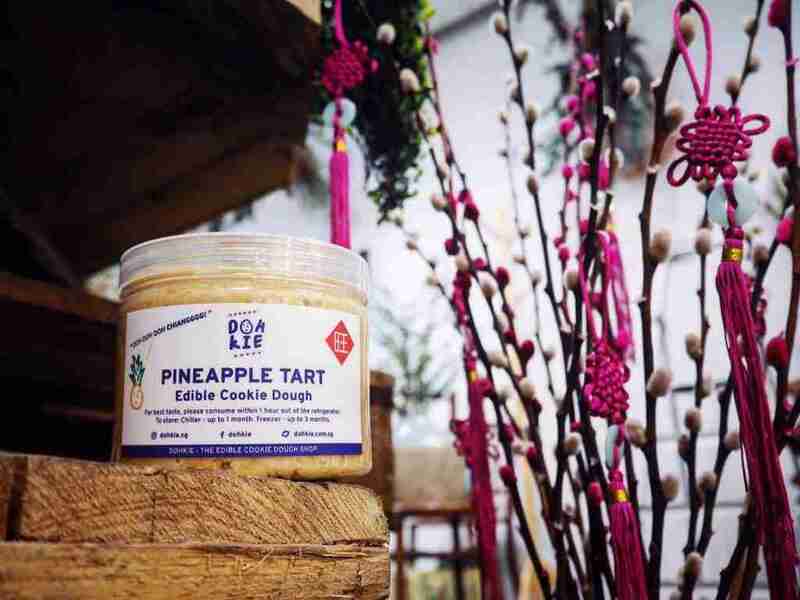 Dohkie has just released their CNY seasonal exclusive – Pineapple Tart Cookie Dough – that is guaranteed to be a show stopper! Each gift set comes with a 550g tub and 1 large serving spoon for you to share this vegetarian-friendly homemade goodness with your loved ones. Other than ordering via WhatsApp or email, there will also be 22 to 30 jars available daily at their storefront for walk-in purchases. For orders with less than 10 tubs, kindly place your order at least 1 day in advance. For larger orders with more than 10 tubs, please order at least 2 days in advance. Mdm Ling Bakery is especially popular among young mummies! Their wide range of cookies span from traditional flavours to modern ones that kids love such as Almond Chocolate Cookies and Wholemeal Raisin Cookies. One of the healthier alternatives would be Cranberries Florentine as they contain a wholesome mix of nuts and cranberries. 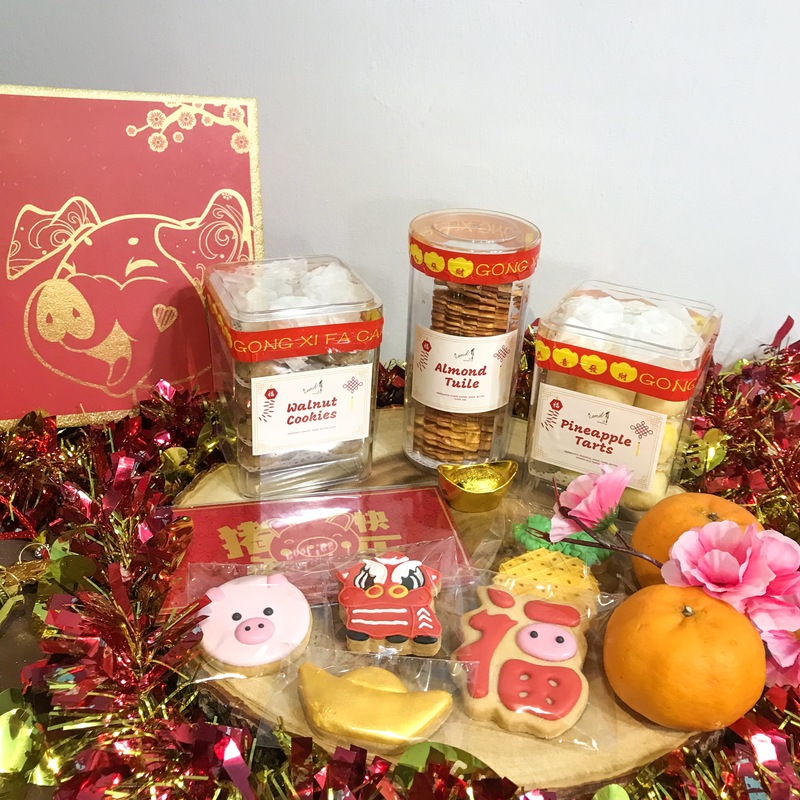 Mdm Ling Bakery has also released a highly-reviewed Limited Edition Chinese Zodiac Auspicious Cookies Collection which includes 12 bottles of CNY goodies – each designed to have a symbolic meaning. Use the promo code “LOVE-THEM-ALL” to enjoy $2 off all cookies (valid till 15 February). Free tasting is available at their various retail partners and pop-up booths. Garden Picks is dedicated to bringing more than 100 varieties of well-loved wholesome snacks to you. 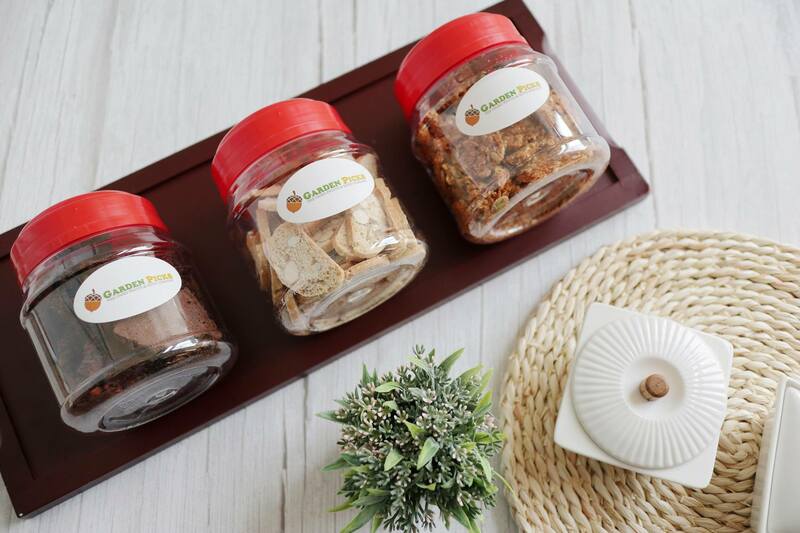 With a guarantee of being factory-fresh, they have launched 3 new healthy snack additions this CNY – Brownie Brittle, Almond Biscotti and Coconut Super Seeds Clusters. As part of a collaboration with Kellogg’s, Little House of Dreams is giving away 3 hampers (worth $60 each) with any purchase of a Butter Cornflakes cookie tub. Moreover, with every $60 purchase of their CNY goodies, you will be given free custom designed red packets! Unique cookie flavours include Hae Bee Hiam, Earl Grey and Orange Cranberry. Up to 20% discount for bulk/corporate orders. Sistersfield is a Quek-family baking business of over three decades. 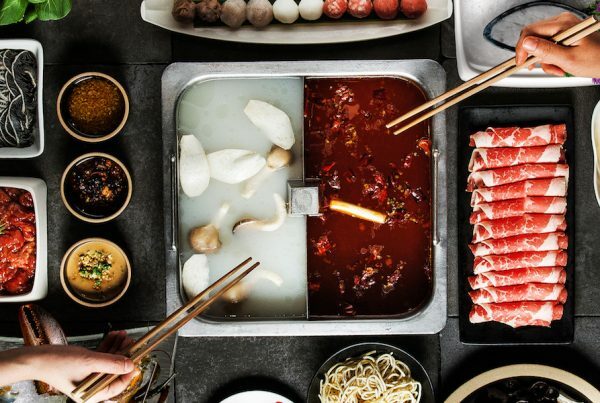 Known for Mama Quek’s signature American style bakes and dishes, all her original recipes have been passed down to her children who inspired the launch of this business in the first place. Today, her children has taken over the business with a fiery dedication to channel their mother’s passion on all their products. If you need customised gifts for a special occasion, Oh My Desserts is the one to turn to! They specialise in baking decorated sugar cookies that are too adorable to be eaten. Other than assorted CNY cookies, they have baked conventional but tasty goodies like beehive cookies, arrowhead chips and almond tuiles! Refer to their order form for the full menu with the available choices of goodies for the customisable sets. Kindly place orders at least 5 days in advance as all items are freshly baked upon order. Meet ups at any MRT station to your convenience at $10.00 (subject to availability). The Better Half was started by two passionate individuals who believed that coffee and baked goods go hand in hand. 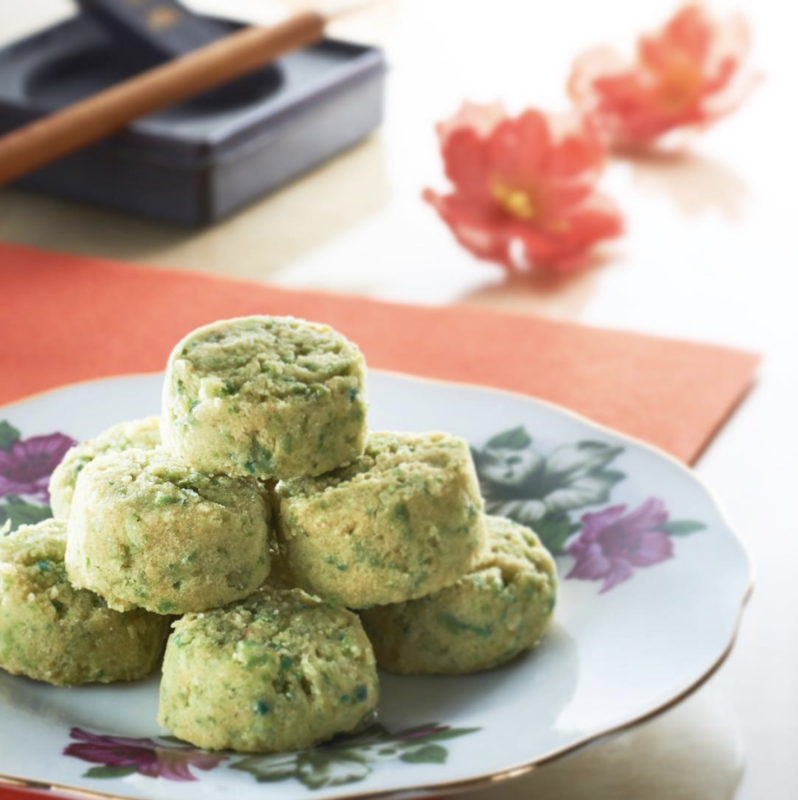 Coming together to complement each other with their baking and creative skills, they have designed 2 main products this CNY – Mandarin Orange and Pineapple Tea Cakes and the 团 Cookie Package. 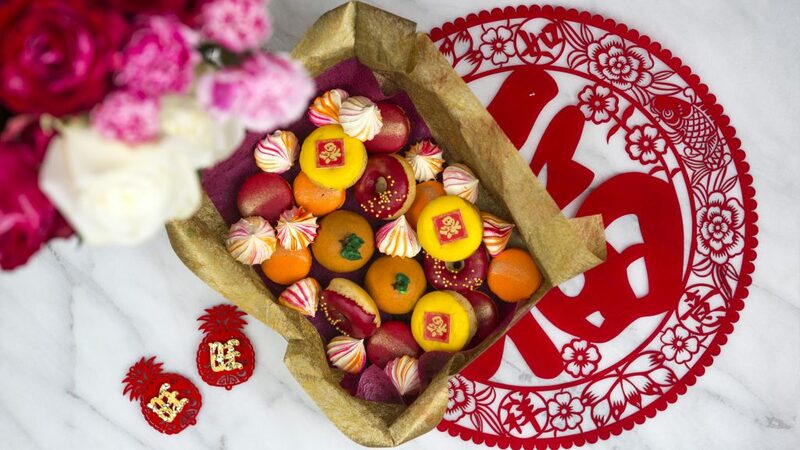 These quirky flavour combinations blend well in unison to form your ideal CNY goodies. L.E. Cafe Confectionery & Pastry is one of the oldest and most well-loved pastry stores in Singapore. Because of their popularity, orders for CNY goodies typically open from the October prior to CNY, and cease in early January. However, some of their most favoured items will still be in stock for walk-in purchases. To prevent a wasted trip, give them a call to enquire for available stocks first. 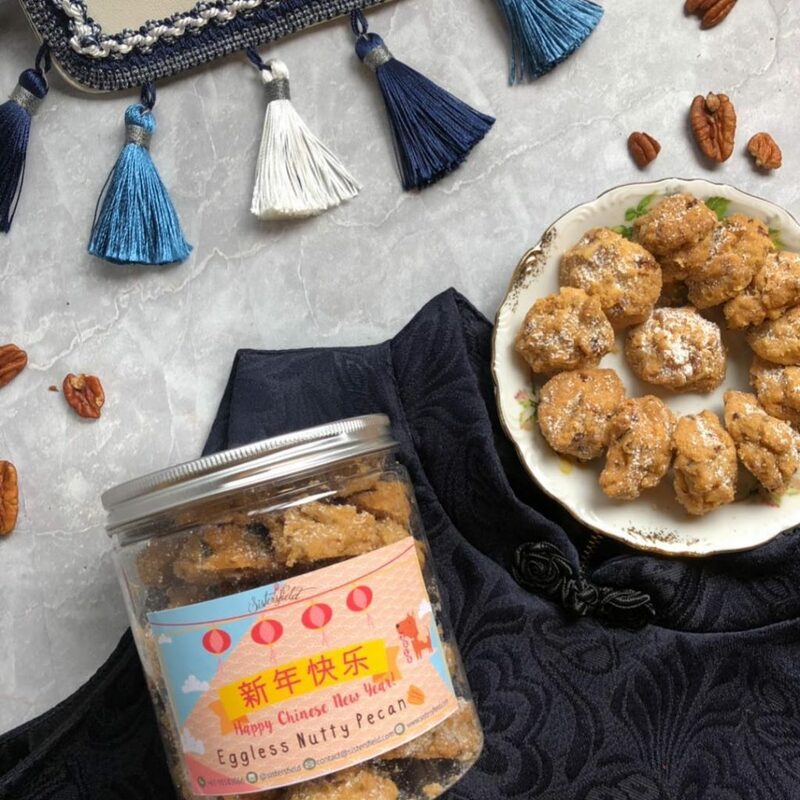 Claiming to be highly addictive, these CNY cookies from Baker’s Brew are available in four savoury flavours to satisfy your taste buds. Additionally, they come in tins that have been beautifully designed with sophisticated Chinese imperial embroidery. Grab the Imperial Collection (Bundle of 5) with your family and friends to get a better rate! Enjoy 8% discount when you purchase 3 or more tins! For online orders, use the promo code CNYEB2019 at check out. One of Creme Maison’s signature CNY goodies is their fragrant pineapple truffles. 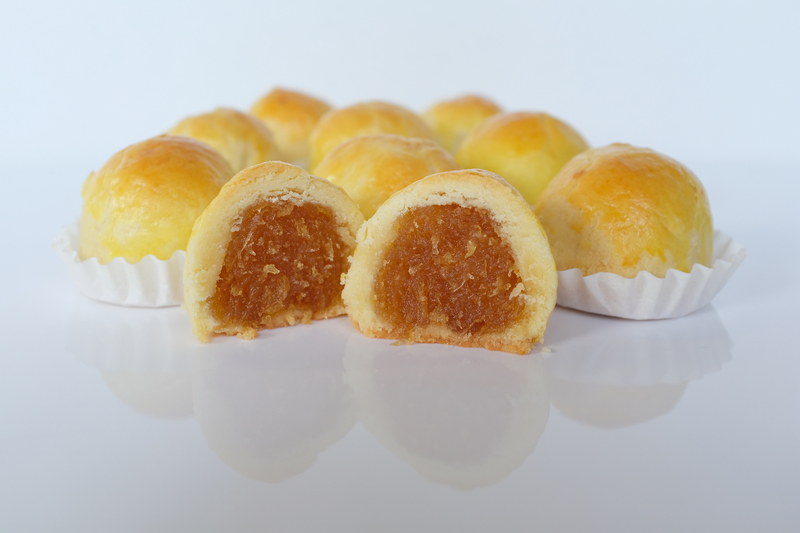 Innovatively available in 6 flavours, these delightful treats provide a modern spin on regular pineapple tarts. On top of that, their gorgeous Blossom Treasure Dessert Box features 4 sweet treats for all the sweet tooths out there. A firm believer of we are what we eat, the founder of Good Bites Only is a mother of 2 who seeks to create wholesome recipes for her family. 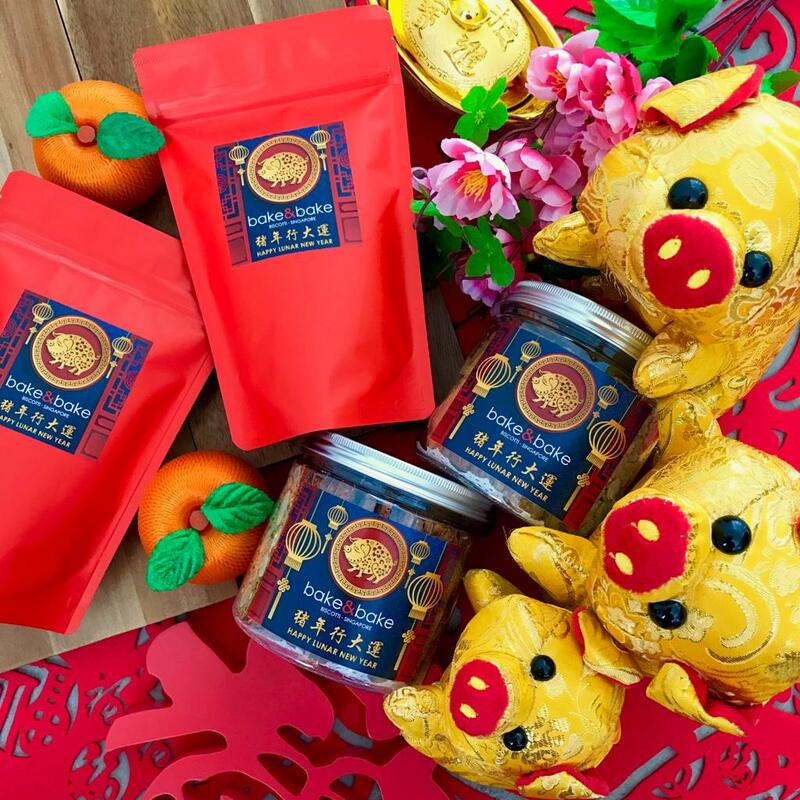 If you’re a health nut, these CNY goodies are made for you as organic ingredients are used as much as possible. 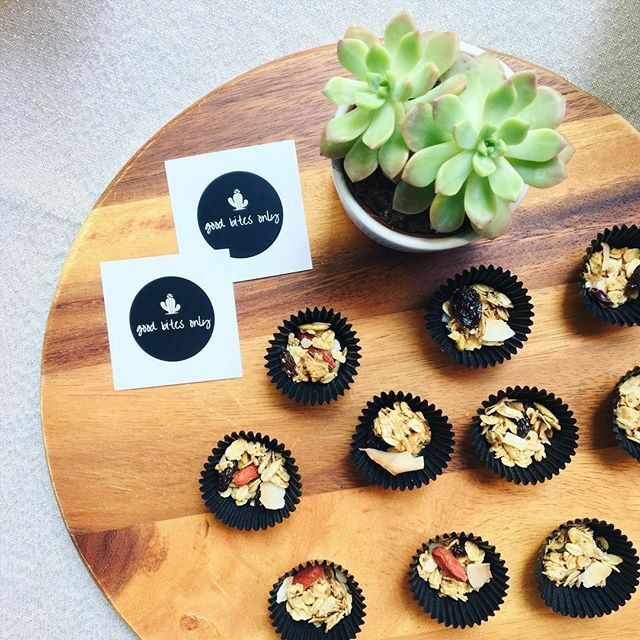 In fact, their Golden Crunch was a hit at the recent Yogafest W.E event! Kindly place your orders at least 3 days in advance. Well-known for their Bakwa Floss Cake retailing at Bee Cheng Hiang, Cakerholic has made Crunchy Bakwa Cookies, Ondeh Ondeh Tarts and Earl Grey Pineapple Tarts this CNY. Each recipe is original and have been constantly improved based on customer feedback. Guaranteed to be a proportion that is perfect for your palate, one bite is simply not enough! Get any 3 of their goodies for just $66.00 (U.P. $74.70)! Deco Chiffon Cakes was founded by Susanne, a renowned cook book author and chiffon cake artist. 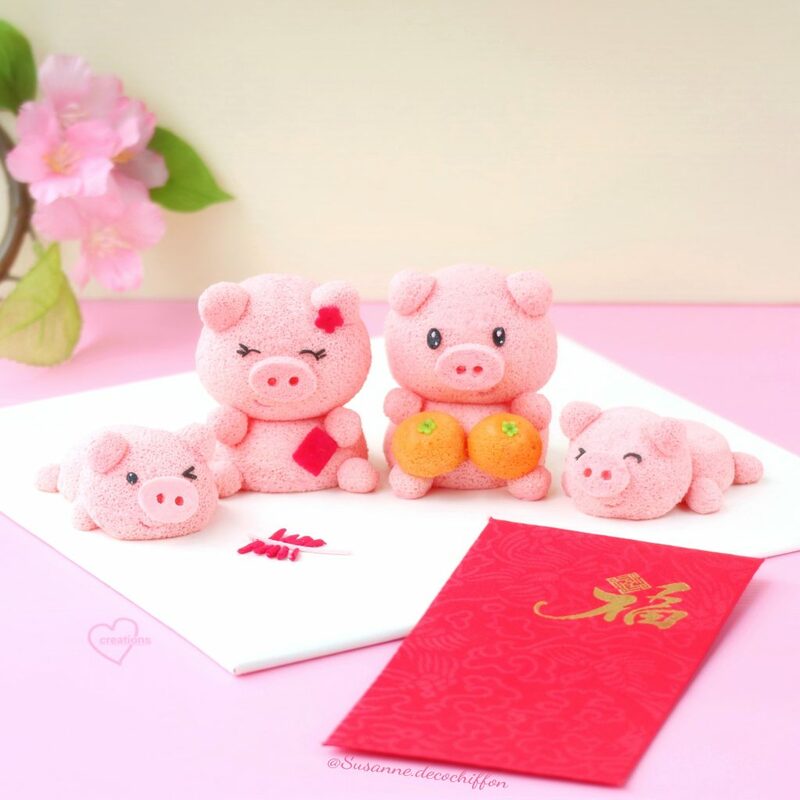 This year, she has created this adorable Bandung Chiffon Cake Piggies to celebrate the year of the pig! Her captivating creations are for sale, however, all 2019 CNY slots have been filled up. If you are interested to learn how to bake these cakes for your little ones, you can do so by signing up for their baking classes. Alternatively, refer to her blog for a detailed recipe and the reveal of the best meringue technique (French, Swiss or Italian) for making chiffon cakes. 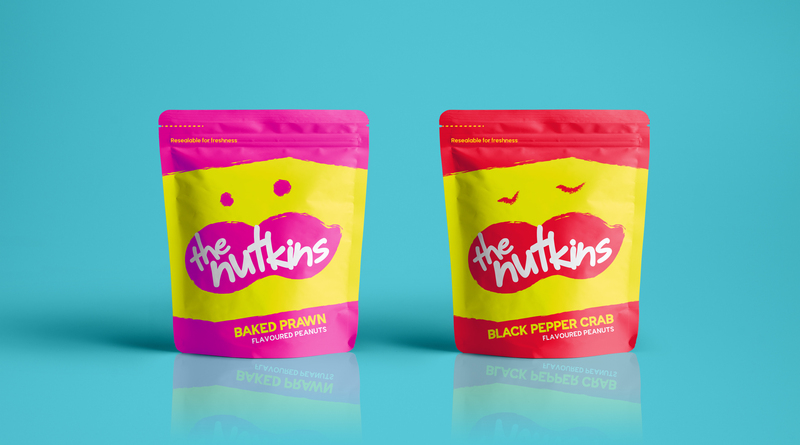 The Nutkins is giving away their uniquely flavoured peanuts to 3 lucky winners! Each winner will be getting 1 x Baked Prawn Flavoured Peanuts (100g) and 1 x Black Pepper Crab Flavoured Peanuts (100g). This giveaway has ended and winners have been announced on our Facebook. *Disclaimer: This giveaway is sponsored by The Nutkins. If, for any reason, the sponsor fails to send the prize or is unable to, Bumble Scoop will not be held responsible for supplying the prize or the value of the prize to the winner. Intrigued by celebrity and influencer gossips, Bernice is passionate about finding the latest scandals and good deals to get a bang for her buck! Her closest friends know her as someone who has an irrational love for Disney's Stitch and an unwavering loyalty to KOI. 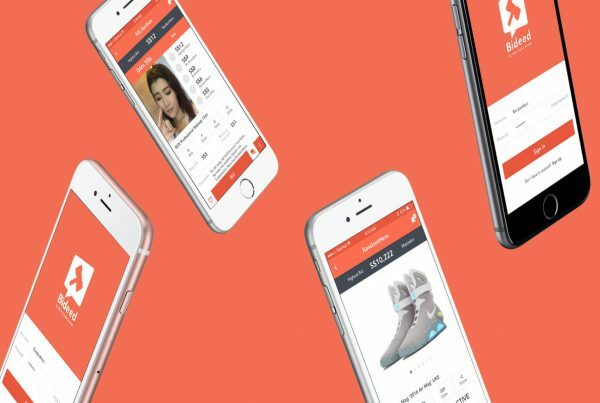 Next PostLocal Skincare Start-up Got Caught Smuggling Drugs Unknowingly. We Interviewed Them to Find Out What Happened. Liked and shared BUMBLE SCOOP FB and Instagram pages. Bumble Scoop reviews and features the most captivating topics that are popular on the internet right now. We gather insights on trending queries on search engines and deliver relevant content for specific target audiences. Simply put, we talk about things that you google about. Copyright © 2018 Bumble Scoop, All Rights Reserved.